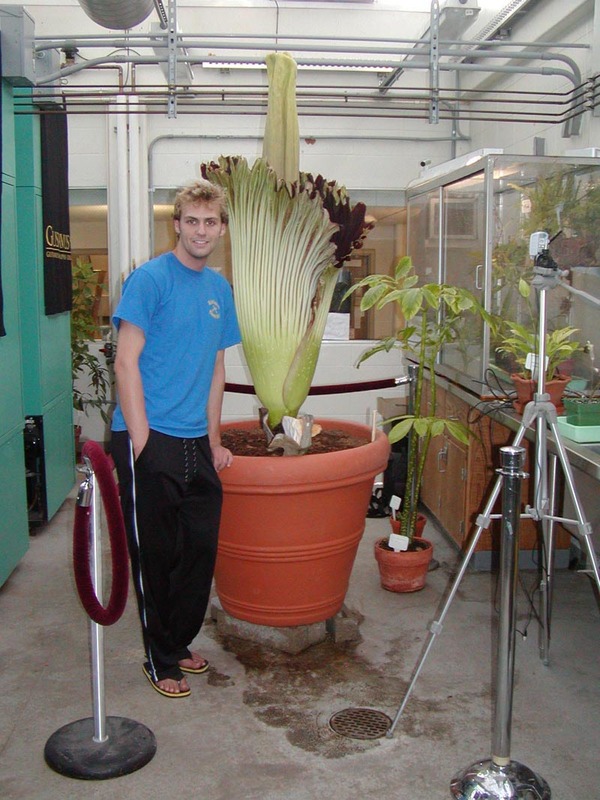 For those readers who might initially have thought otherwise, this post deals with Perry, our largest plant of the Titan Arum / Corpse Flower (Amorphophallus titanum), not with a human of that name. Quite a while back (May 22, 2007), I posted a preliminary transcript of written comments by people who were exiting the Perry Room, reeling from Perry’s visual and olfactory glory. I have now transcribed the entire set of comments, and will post them here in installments. This will be the depersonalized, family-friendly version of the comments. That means that comments (1) that identify specific people (in spite of the frequently entertaining nature of those comments); (2) that are, in the judgment of this blogger, too crude for the sensibilities of the blog’s readership; and (3) that show evidence of incipient psychopathy will all be redacted. Thanks much to Kevin Oberg for suggesting that we have visitors write down their impressions – this has turned out to be a highly interesting historical document. Onward to Installment #2 (this will repeat some of the items from Installment #1); I have preserved the original spellings, phrasings and other idiosyncratic features provided by the authors of the comments. It smelled like you put a dead rabbit & a bunch of weeds into our dumpster a week ago – & it’s July – yech!! a very dirty guppy bowl! Click here to view Perry via webcam. Better yet, click on over to Nobel Hall in person, and request a personal audience with Perry, via one of his/her acolytes.